I'm starting to believe in the influence of lunar cycles on wine. I'm not saying that wine is better if it's made biodynamically, I'm not trying to tell you what you should do, there is no dogma here. I'm talking about what I'm finding regarding the days when wine shows well and when it doesn't. I haven't done any kind of study, although I might soon try to do just that. But through casual conversations with people who know and love wine, I'm finding that when a wine doesn't show well it turns out to have been a root day or a leaf day. And when a wine shows great, it turns out to have been a fruit day or a flower day. Disclaimer: I've only been paying attention to this for a few months and following along myself for a few weeks since reader TWG kindly emailed me a copy of the 2010 calendar. And there have been exceptions. But I kid you not, the calendar has been so reliable that I'm starting to plan dinners and tastings around it. And I'm already at the point where I cannot imagine opening a special bottle unless it's a fruit day. Listen to this: on Saturday we had our friends Clarke and Sophie over for dinner and we opened 7 bottles of wine. Lest you think that we are lushes, we didn't drink all of the wine, only most of it. Every single wine showed spectacularly well. And yes, it was a fruit day. On its own this means absolutely nothing, of course. But when was the last time you drank (not tasted) 7 bottles of wine in an evening and every one of them showed beautifully? The last time I drank this many wines in an evening was the Savigny-lès-Beaune night I hosted and nothing showed very well. It was a root day, as it turns out. Check that, I drank loads of wine the other day at Levi's luncheon, and they showed very well, for the most part. It was a flower day, and it was the only favorable day for drinking that week until Friday. I wonder, did Levi check the calendar before choosing the date of the lunch? Who really knows what's going on with these things. I put a period at the end of that sentence because it is a rhetorical question. So please don't get riled up in the comments - I'm not trying to convert anyone, I'm not making any kind of argument, and I haven't done enough to know how I feel about this yet. But as you have surmised, I am greatly intrigued. NV Equipo Navazos La Bota de Manzanilla Nº 16, $39, Eric Solomon Selections. Imported by European Cellars. We drank this with my first ever attempt at scallop ceviche. The wine was the essence of Manzanilla, although in drinking the leftovers two days later (on a root day) I can say that it would benefit from a few years of bottle age. It was delicious, but burly and assertive when we drank it, and now it is completely harmonious and gorgeous. 2005 Damien Laureau Savennières Le Bel Ouvrage, $32, Jon-David Headrick Selections, Imported by European Cellars. My favorite Savennières producer right now, Laureau's wines are consistently delicious and very expressive. Bel Ouvrage, anyway, as I've never had his other cuvée called Les Genêts. my first time with the '05, this wine showed more overtly fruity than any other Laureau wine I've had. That's to be expected from 2005, but it was also very floral and mineral with an almost powdery sense to it, and with great poise and balance. I loved this wine and imagine that it will age very well. 2006 Paolo Bea Arboreus Umbri Bianco, $66, Neal Rosenthal Imports. My first time with Arboreus, or any of Bea's white (orange) wines for that matter. This is a local strain of Trebbiano that spends lots of time in contact with the skins and then lots of time on the lees. It was incredible in that the aromas were absolutely the purest of orange fruit, fresh juicy and vivid orange and tangerine. Some rocks too, but I was wowed by the fruit. We drank this and the Savennières with flounder baked in parchment paper (look out, my fish monger is back at the market). 2001 Azienda Agricola La Torre Brunello di Montalcino, $69, Neal Rosenthal Imports. Beautifully rich and dark cherry fruit and a bit of soil. Delicious, but came across as a bit one dimensional on night one. One dimensional in a hedonistic and delicious way. This is probably because the wine simply needs time. I drank the remnants the following evening (still a fruit day) and the wine was utterly superb, showing everything I would hope for from a Brunello. A beautiful interplay of pungent leathery earth and vivid dark cherry fruit, an herbal finish that really resonates, clarity and purity - this wine was a bit of a revelation for me. 1986 Château Simone Palette Rouge, $50, Robert Chadderdon Imports. What can I say here? As Clarke put it, this was a great example of a noble old wine. The nose was of the forest, and very mellow, while the palate was fresh and vibrant, still showing good acidity, and showed that seamlessness that makes it silly to try to describe the flavors. The whole package was really quite beautiful. We drank this and the Brunello with braised pork ribs, creamy polenta, and kale. 2001 Domaine de Montbourgeau L'Etoile Cuvée Spéciale, $26, Neal Rosenthal Imports. What a bounty of ripe fruit! Yes, this is made in the under-the-veil style and is gloriously oxidized, but the brightness and clarity of the fruit was amazing. I assumed it was Savagin, but Sophie told us that it is Chardonnay in 2001. This was great with a Vacherin du Jura, the creamy cow's milk cheese that is wrapped in a band of spruce bark. And then after BrooklynLady's delicious home made chocolate pudding we drank a bottle of 2002 Huet Vouvray Pétillant, $33, Robert Chadderdon Imports, because we were a bit drunk and it just seemed like the right thing to do. A great showing there, as well. I loved how completely woolly the wine was, compared with the flowery fruit and crystalline shimmer of the Savennières - such wonderfully different expressions of Chenin Blanc. The other day I was lucky enough to attend the luncheon honoring Levi Dalton, the head sommelier at Convivio who is now moving to Alto. Levi is one of those guys who loves to share whatever he has with you, so as the host of the luncheon, he opened some pretty amazing wine. I drank some things I've never had before and I want to share a few thoughts. Bottles were passed around the tables in a mostly random order, so you helped yourself to a little pour as each bottle made it to the table. The very first wine to hit one of my glasses (I had four, I am proud to say) was the 1986 Mas de Daumas Gassac Vin de Pays de l'Hérault. I've wanted to taste this iconic wine from the Languedoc for a long time now. It is mostly Cabernet Sauvignon and there little bits of many other grapes in there too. Here's the thing - if I were served blind, I would have thought it to be a young wine. Perhaps it's because it actually was the youngest wine at the luncheon, but I just don't know. Supposedly it takes forever for one of these to come around. If this is representative of the '86, it has another 20 years to go before it starts to show some secondary notes. Can anyone shed some light on this Mas de Daumas Gassac phenomenon? 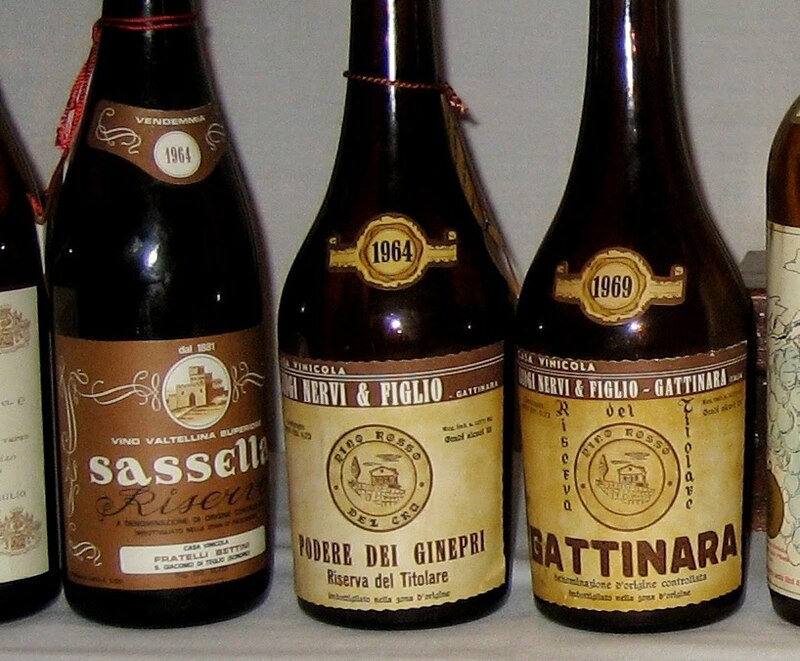 We drank some old Nebbiolo, including 1969 Luigi Nervi & Figlio "Riserva del Titolare" Gattinara, 1964 Luigi Nervi & Figlio "Riserva del Titolare - Podere dei Ginepri" Gattinara, and 1964 and 1967 Fratelli Bettini Valtellina Sassella Riserva. 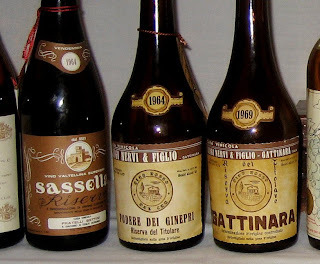 I prefer to drink Nebbiolo that is older than these when I have lunch, but this is what Levi had, so it is what it is. These wines were all fascinating to me - I don't know about you , but I don't drink wines like this very often. I think my favorite was the '64 Luigi Nervi. It was remarkably fresh and vibrant for such an old wine, and it played very nicely with Testa, Convivio's house made pork terrine with fried egg. And then there were the two Baroli, the 1982 Giacomo Conterno Monfortino Riserva Barolo and the 1978 Giuseppe Mascarello e Figlio Villero Barolo. Although I left it to rest in one of my glasses for the entire span of the luncheon, the Conterno never really finished unfolding itself (although it's possible and likely that I simply do not understand the wine). It was a striking wine, and I wish I still had it in my glass. The Mascarello was just beautiful. I don't know what else to say about it, except that it was the physical manifestation of what I imagine great Barolo to be. I loved the 1986 Olga Raffault Chinon Les Picasses too, and the guy I sat next to, David Lillie of Chambers Street Wines thought it smelled great too, but Joe Dressner waved his hand and scoffed at the wine and said it was too green. He imports Raffault's wines, and knows them as well as anyone, so who am I to argue. But I would drink it anyday...There were other great things, including a 1982 Macle Chateau Chalon, but I've said enough about the wine already. The company was great too, an excellent group of people from all over the wine world, all Levi's friends and all happy to be there to congratulate him. It's funny to be the least experienced person at an event like this one. A group of experienced wine pros like this, and with wines like these - I expected the atmosphere to be one of reverence and quiet contemplation. Not at all, my friends. These folks understand wines like this, they've had them many times before. Serious tasting occurred, of course, but so did catching up about daily life. Some one's basement flooded that morning, and they had to stand there with a bucket. Some one else's huge dogs love her apartment, but she's worried that other people don't love it so much, and she's expecting vignerons as guests - what to do? Some one else is annoyed with how disrespectful and impolite competitors often are at industry tastings. Someone else has to leave early to get back to selling wine. Life doesn't stop for 1964 Luigi Nervi, I guess. Anyway, congratulations on your achievements Levi, and all the best in your new role. New York is better for having you here. Is it possible to drink great wine on a daily basis if you're not rich? I'm talking about wines that cost between $8 and $12 a bottle? I think it it is possible, yes. I've been thinking about this lately because my wine buying budget has been cut in the past year, but also because Eric Asimov has written about this several times, most recently pointing to Mike Steinbergers' article in Slate that discussed inexpensive wines he recently drank with mixed results. I can (and will) name some cheap wines that I think are excellent wines. But before that, I want to explain my general approach to this problem. First of all, I reject the notion that as a consumer I should forgive a wine for being inexpensive and expect little of it. Regardless of the price point, if I buy a wine I want it to be excellent. Sure, a liter of Hofer Zweigelt and a magnum of Barthod Chambolle Les Cras are excellent in different ways. But for me to buy the Hofer Zweigelt, its excellence must derive from the smell and taste of the wine, and from its expression of place, not from the mere fact that it is palatable and costs $10. Secondly, I don't think $10 is a rational way to define cheap wine anymore. You know this already - the dollar, although stronger right now, has been weak against the Euro for years. European wines cost more now that they did 5 years ago. That great Beaujolais that sold for $12 in the 2002 vintage costs $17 now. For me the new cheap wine cutoff is something like $12 or $13. Buying a mixed case allows me to buy $14 or $15 wines and pay $12.60 or $13.50 for them, essentially eliminating NY State's drastic liquor taxes, and keeping my average bottle price in that $12-$13 range. Thirdly, the best way to get excellent cheap wine is by choosing your retail store carefully, not by identifying the best individual wines and then buying them wherever you can find them. I don't want to buy a case of any one cheap wine - who wants to drink the same wine on Tuesday, Wednesday, and Thursday, and then again the following week? And I don't want to buy a bottle here and there and pay full retail. I'd rather buy a mixed case, enjoy a greater selection, and pay a little less. 2008 Benaza Monterrei Godello, $11.70, Jose Pastor Selections, Vinos & Gourmet Imports. Chris, the Spanish wine buyer at Chambers has been filling my ear about Galicia for a while now. "Galicia is the new frontier for inexpensive great wine," Galicia this, Galicia that. If this wine is representative of what the region has to offer, then I wholeheartedly agree. Use this wine wherever you would use Sauvignon Blanc, but instead of being annoyed at how mediocre your Sauvignon Blanc is, you'll be thrilled with this wine. Godello is the grape and this version is fresh, balanced, and just delicious. Grapefruit and pith, spring water, coriander? Once I forgot a half-drunk bottle in the fridge for 3 days, and it was even better, completely harmonious. 2007 Domaine des Pothiers Vin de Pays d'Urfé Fou de Chene, $12.60, Fruit of the Vines Imports. This is Chardonnay, technically from the Loire Department, but we're talking closer to Lyon and Burgundy than to Vouvray or Chinon. Perhaps not terroir specific in the sense that the wine would be identifiable as a Loire Valley wine, but that's okay in this case. It's not easy to find delicious, varietally correct, old school Chardonnay at this price. Here is one. Ripe lemony orchard fruit infused with minerals, well balanced and fresh. The finish is surprisingly long and stony. 2008 Knebel Mosel Riesling Trocken, $12.60, Mosel Wine Merchant, USA Imports. An expressive and unmistakably Mosel wine that treats you gently but also cuts like a knife. I've been drinking a lot of this wine lately and I love it every time. We did split pea soup - very good. Crab boil, not as much, as the wine is lean and got a bit lost amidst the Old Bay. Pork cutlets with mustard and kale - excellent. 2009 Weingut Hofer Grüner Veltliner Wienviertal, $10.80 (1 liter), Michael Skurnik Imports. This delicious Grüner is a bit simple on day 1, although it is well balanced and shows some of the lemongrass lift that is typical of the grape. On day 2 (get your own stopper, this is a crown cap) the wine shows more complexity and harmony, with herbal tones, more depth of fruit, and an intriguing sour cream like note on the finish. 2007 Laurent Barth Pinot Blanc, $12.60, Louis/Dressner Selections. This is the delicious Alsace Pinot Blanc I drank the other day with a Vacherin-style cheese. Such an expressive and delicious wine, focused and mineral driven. 2008 Michel Brégeon Muscadet Sèvre et Maine Sur Lie, $12.60, Kermit Lynch Imports. I really like the '08 Muscadets so far. This one is quite intense with citrus and creamy lees on the nose. The palate is piercing with minerals and acidity, but is approachable with lovely herbal and citrus flavors. Quintessentially Muscadet, we had it the other night with cornmeal crusted fried flounder and it was great. NV Pedro Romero Manzanilla Sherry Aurora, $10.80 (500 ml), Frontier Wine Imports. This wine offers a combination of brisk salty tang and the rich vinosity of very old solera wines. It feels weightless but is quite intense, especially on days 2 and 3. I've yet to encounter the food that this wine doesn't compliment. 2009 Weingut Hofer Zweigelt, $10.80 (1 liter), Michael Skurnik Imports. I've gone through almost a case of this wine since November. Beaujolais starts at $15 now, and this wine, although most certainly not Beaujolais, fills the cheap Beaujolais role these days in my house. It has the texture and body of a well made Beaujolais, and like Beaujolais, I prefer this wine served cool. It shows smokey, medicinal, and herbal flavors. There is fruit in there too, black currants maybe, but this is not a fruit-driven wine. We've enjoyed it with mushroom omelets, with a spicy tofu dish, with turkey burgers, and all by its lonesome. You could have this wine with lighter fish dishes. 2008 Domaine Guion Bourgueil Cuvée Domaine, $9.90, Fruit of the Vines Imports. I've actually not had this vintage yet (my bottle waits for the right meal in the fridge), but I like this wine each year. This is slightly rustic Cabernet Franc. Typically everything you'd expect in a red wine from this place - pure ripe fruits, earth, mineral, raspy tannins that are easily tamed by whatever food you're eating. 2007 Château la Grolet "G" Côtes de Bourg, $12.60, Fruit of the Vines Imports. This wine is 90% Merlot from Bordeaux. I'm going to let that sink in for a moment. On a recent trip to San Diego my interest in Bordeaux was piqued, and if David Lillie says he has a couple of excellent and cheap Bordeaux wines, I'll try them. Honestly, this wine is great. Gravel, tobacco, damp soil, pure dark fruits. fresh and balanced, just delicious wine, and improves on the second day, becomes very harmonious. Not a light wine - think roasts or a steak or a burger, but not in any way overwhelming. 2008 Domaine Rimbert Saint-Chinian Les Travers de Marceau, $13.50, Jenny & François Selections. This is a blend of Mourvedre, Carignan, and Grenache from the western Languedoc. For a leathery and dark wine that sheds grains of soil with every sip, this wine manages to have great purity and poise. Think thinly slices dry sausages, or roast chicken with potatoes and mushrooms. 2008 Clos la Coutale Cahors, $13.50, Kermit Lynch Imports. I always enjoy this wine, a meaty Malbec with a bit of Merlot in the blend. It offers lovely fragrance and texture, and achieves an elegance that I find lacking in most Cahors. Of course it's great with beef, but there's something about the way it works with duck that really pushes my buttons. Lazy Lady Farm in Vermont is Laini Fondiller's life's work. Located in Westfield Vermont, not far from the Canadian Border, Fondiller's farm is off-the-grid. Yes, that means that the electricity that is used on the farm is generated by solar panel and wind generators. Fondiller does mostly everything herself, from milking to washing the rinds. Her's is an interesting story, and NY Times Magazine recently ran a story on her. That and $2.25 gets you a ride on the subway. Call me cynical, if you like, but none of that makes any difference to me if Lazy lady cheeses don't taste good. I respect and admire her commitment to minimal impact farming, and that she generates her own power and feeds the byproducts of her cheese-making to raise pigs - those are great things to do, things to aspire to. But I still want the cheese to taste good if I'm going to buy it. The good news is that the cheeses taste great. The one's I've had, anyway. My favorite so far is probably the deliciously creamy Lady in Blue, a blue cheese that is more fruity and creamy than salty. The other day I saw a Lazy Lady cheese that I'd not seen before (Fondiller's cheeses are seasonal, of course, as is cow and goat milk in Vermont), something called Fil-A-Buster. I figured it would be a fitting cheese to eat this weekend as the ladies and gents in Warsh-ington had it out over the health care bill. Fil-A-Buster is a raw cow's milk washed rind cheese that's available from January through May. It is similar to a legendary cheese from the Jura called Vacherin Mont D'Or, in that the cheese wheel is bound with a resiny and aromatic strip of spruce bark. But Fil-A-Buster must be aged for at least 60 days, as we are complete prudes about the bacteria in raw milk over here. Vacherin is made in smaller wheels and is a runny gooey mess of deliciousness. Fil-A-Buster is a wonderful cheese that needs to be serves at room temperature in order to reveal its full flavor. Please don't eat around the rind if you try this cheese - the rind makes the whole thing so special. The creamy texture becomes pleasantly grainy with the rind, and the clean milky flavors take on nutty tones, particularly the somewhat bitter skins of fresh walnuts. The resiny spruce aroma lingers after swallowing. The spruce bark takes on quite a gnarly appearance after 2 months in a cheese cave. We ate this cheese with the 2007 Laurent Barth Alsace Pinot Blanc, $14, Louis/Dressner Selections. This is an excellent wine, and a great value at this price. It is a thing of liquid rock - the aromas are wet rock and limestone and more rock. Almost painful in its piercing mineral focus, but with an hour it relaxes a bit and shows a gentle undercurrent of honey and something like eucalyptus. It's well balanced and lively, and honestly has nothing to do with those round and blowsy Pinot Blanc wines that are common. It seems to be much more about place than about Pinot Blanc, which I think is a good thing. Although it doesn't have the depth and complexity of Dirler's Pinot Blanc, it's also less than half the price. That said, I wish that I had opened a bottle of Jura wine with this cheese, something made in the intentionally oxidized style. The rich nutty character of a wine like that would have been an even better partner for this cheese. The Barth Pinot Blanc is great, but might be a better match for younger fresher cheeses, or perhaps with something like weisswurst and sauerkraut. Thanks so much to y'all for your thoughtful recommendations on food and drink in New Orleans. Between the comments and emails, I had more than 10 spots to think about, yet only one lunch, sadly. Many of the restaurants that seemed most appealing to me were closed on Monday or don't offer lunch at all. Upperline, for example, seemed like just what I was looking for - a place with a bit of history that offers real Creole food. But it doesn't serve lunch and is closed on Mondays and Tuesdays. Galatoire's looked perfect too, but is also closed Mondays. August's menu looks awfully good, and it's open for lunch, but the menu didn't seem to be focused on Creole or Cajun food. I wanted to eat something like Gumbo or Étouffée or Jambalaya or gulf shrimp or turtle soup. In the end I chose Herbsaint, named after a brand of Absinthe. I had only a few hours on Monday and I wanted to take the St. Charles streetcar all the way to the end of its route. Herbsaint is located on St. Charles Avenue near the beginning of the route. And although the lunch menu is not entirely Creole food, I had my eye on a few things. It is a bright and welcoming space that on this Monday afternoon bustled with people in suits enjoying their lunch break, and also with people dressed casually. I sat at the bar and was immediately impressed with the extensive wine list. Plenty of interesting bottles at all price points, lots of enticing Champagne, and several magnums that would be great fun to open with a group at dinner - 08 Tempier Bandol Rosé comes to mind. There were 4 or 5 whites and 4 or 5 reds by the glass, and a Fontsainte Corbières Gris de Gris rosé too. My plan was Gumbo and then fried catfish with green rice, but there is this problem I ran into in New Orleans. There is a "grocery store" on every block that sells fantastic po'boys, the delicious sandwiches on soft French-style bread. You try walking past the 7th grocery store advertising things like fried oyster po'boys or hot roast beef with gravy po'boys. By the time I arrived at Herbsaint, it's fair to say that I had already had at least one lunch (and I must say that the fried soft shell crab po'boy I ate was a truly wonderful thing). So instead, it was a light lunch. I began with a salad of crisp lettuces with bacon and buttermilk blue cheese vinaigrette, $8. It was okay, nothing special. But the Sazerac cocktail, $8.50, I drank while eating the salad, now that was great. Next I had what turned out to be the best thing I ate in new Orleans (although that crab po'boy was mighty close), a small plate of Louisiana shrimp and grits with Tasso and okra, $11. Everything about this dish was perfect, and I already long for the next time I can eat it. A square of creamy and cake-like grits with plenty of fresh, perfectly cooked, and utterly succulent Gulf shrimp lying about in recline. Chunks of okra and Tasso, the spicy Cajun smoked pork shoulder for texture and flavor, and all of this upon a deeply flavored brown sauce that must have been based on a roux. None of the wines by the glass seemed right with this dish (I almost ordered the 06 Épiré Savennières Cuvée Speciale or the Cornières rosé), until I noticed La Cigarrera Manzanilla by the glass for $5. It was perfect with the shrimp dish - bright and briny and pungent. Next time I go to Herbsaint I want to go on an empty stomach, and with at least one other person so that we can take better advantage of that wine list. And I will not lie to you - the street car ride was lovely, but I was a drowsy man. Thanks again for all of your advice on where to eat and drink in New Orleans. Baked rice has become one of my stand-by dishes in the past year. It's hard to imagine a more versatile kind of cooking. Basically, you season the rice, add whatever vegetables or meat you like, some stock, and bake the rice. Doesn't require a cooking school degree. This technique is used in one form or another in cuisines all over the world, from Jambalaya to Paella to Biryani. I've been working on my Pulau-style rice for a while now and I must say, I'm getting pretty good at it. I made one the other night that's worth sharing. I must now warn anyone of Persian, Indian, Pakistani, Afgan, Turkish, Azerbaijani, Kazakh, Kyrgyz, Marathi, Uzbek, Turkmen, Armenian, or other Central Asian descent, that my version of this dish is wholly and completely inauthentic. But I'm going to share it nonetheless. I like to begin with a lot of fresh turmeric. Peel it and pound it to a paste with a mortar and pestle. Turmeric is one of those delicious foods that is secretly incredibly healthy, and we should all be eating more of it. Finely chop an onion and cook it over medium heat in butter in a heavy bottomed pot. When the onion is translucent, add the turmeric and a bit of salt and stir as you cook. Add whatever mix of spice you like now. You can add spice powders, but I prefer whole spices here. There is no one right way - use whatever feels right to you, try different combinations. This time I used cardamom pods, fenugreek, coriander, cloves, cumin, and black peppercorns. Add two cups of rice - use good quality rice, preferably Basmati, although jasmine rice will do as well. Toss the rice well with the onions and spices, try to coat every grain with the buttery spice paste, and cook for a minute or so. Add some more salt. Now is the time to add whatever meat and vegetables you like. Since I bake mine for only an hour, I don't use cuts of meat that require long slow cooking. I like to use lamb shoulder or leg, but chicken thighs work well too. For the vegetables, I find that peas, cauliflower, mint, and parsley do well together. Stir well, add a bit more salt, and now the liquid - 2 and a quarter cups worth. You can use stock from a box, but I implore you to make and use your own chicken stock. It really is that much better. The stock will come to a boil very quickly - turn off the heat, cover the pot with a tight-fitting lid, and put the pot in a 275 degree oven for an hour. Take it out of the oven and let it rest with the lid on for about 10 minutes. You'll have something that looks a bit like this, although hopefully you used more butter and stirred your rice better, so the grains don't stick together as much as mine did this time. You'll have dinner for two adults and a load of leftover food. Or, as in my house, two days of lunches for two little kids and plenty of food for adults to pick at. What to drink with this kind of food? Riesling seems to be the go-to wine for this kind of food, and high acid white wines certainly do work well. I actually prefer light bodied red wines though, things like Poulsard, Beaujolais, or even Zweigelt. Good versions of these wines offer clean fruit flavors, perhaps complicated with spicy fruit and earth, and can offer good structure without angular tannins that would conflict with the assertive flavors of this dish. But everyone loves Riesling with Indian food, and so I figured this time I could be contrary simply by doing what everybody else does.. The 2008 Clemens Busch Riesling Kabinett trocken, $21, Mosel Wine Merchant, was in fact a lovely match. And it was delicious before dinner too, while the rice was baking. The Kabinett trocken designation means that the grapes were harvested at Kabinett sugar level, but the wine was fermented dry. And it is 11.5% alcohol, whereas Kabinett level wines that are not fermented dry are typically around 8% alcohol. This wine is completely dry, but it not in the searingly dry and acidic style. It feels lush, actually, with rich aromas and full flavors. Initially a bit shy, the nose expands with flowers and spicy tones, and just the suggestion of fruit. Perfectly balanced on the palate, this wine has the acidity and focus to cleanse the palate and the depth and richness to support the aromatic food. I love wine like this - it costs about $20 but it is absolutely world class wine, it would compliment any food you throw at it, and it will probably live forever. 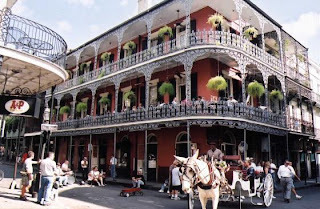 I will be traveling on business in New Orleans next week. Most of my time is spoken for, but I will have several hours on my own one afternoon. I'd like to go somewhere for lunch and eat delicious food that is specific to New Orleans. I've never been to New Orleans and know nothing about it at all. If you know of such a place, or a website where I can read about such things, your advice is most welcome. A longtime reader contacted me the other day to say that he would be traveling in Florida, and would be having dinner with his wife at a restaurant in Naples. He wanted to know what I would drink if I were spending about $100. He said that he would prefer to drink either white or red Burgundy, but he would be open to other suggestions. Some one at Bleu Provence clearly loves wine - the list is extensive and detailed and contains more than a few wine-geek gems mixed in with the blue chips. Because I am an astonishingly competent procrastinator, I looked through the list carefully and came up with what I think are a few great ways to spend $100 on wine at Bleu Provence. We played this game together in July, by the way, and it was good fun. I'll tell you what I came up with of course, in the comments, but I'd love to hear you first - what would you buy with $100 at Bleu Provence? A few years ago I spent a lot of money on two bottles of Chablis, money that I wish I could have back right now. It's not that I don't like Fèvre's wines, I haven't had enough of them to know for sure. But the 2005 Domaine William Fèvre Grand Cru Le Clos, those bottles were an expensive mistake. I paid up for the wrong vintage. Chablis is a difficult wine to get spendy with, assuming you want to drink Chablis that shows real Chablis character. In a very ripe vintage like 2005, the character of the vintage can easily overshadow the expression of terroir. I drank one of these bottles not too long ago and although the wine was very nice, it was nice as a good Chardonnay, not as Le Clos. Probably it needs more time, but still, I would need to be convinced that this will become a glorious expression of Le Clos. I'm not sure that I would buy William Fèvre's wine again if I were paying $75 for Chablis. At this point I think I would rather have something by Dauvissat. But the thing is, I'm not sure I would pay $75 for current release Chablis right now. I like the Raveneau wines I've drunk, Dauvissat too, but there are some $30 Chablis bottles that are pretty great too. Closer in quality to the top guns than Savigny-lès-Beaune is to Chambertin. My favorite Chablis producers these days are Alice and Olivier de Moor and Gilbert Picq. Both make delicious wines that really say something of Chablis. The other night we had some friends for dinner and we ate scallops, among other things. We drank two wines by Picq, both from the excellent 2007 vintage. These wines reminded me of how completely delicious Chablis is when it's good. They also reminded me of what Chablis is supposed to taste like - the fruit, the white flower, everything is infused with this seashell iodine character. The best descriptor that I've read for Chablis is "tidal pool." I think it makes perfect sense. Both of these wines had it. The 2007 Gilbert Picq Chablis Vieille Vignes, $23, Polaner Imports, might be the greatest value in Chablis. This wine is particularly good in 2007. It shows richness and intensity that come from old vines, and also a great balance of fresh ripe fruit, floral hints, and a low register iodine nuance that makes it unmistakably Chablis. It has good acidity and will probably improve over the next 5-plus years in the cellar, and I'm happy to have a few more bottles to watch this unfold. I have less experience with the 2007 Gilbert Picq Chablis 1er Cru Vosgros, $29, Polaner Imports, than I do with the Vieille Vignes, but in 2007 this wine is a definite step up. The aromas are more broad and more delicate, the flavors more clearly defined and resonant. And the wine offers a bit more extract and depth, yet feels more graceful. This is seriously classy wine, and it's under $30. I should have bought more than I did. When I think that I could have five bottles of this instead of two of the 2005 Fèvre's, I feel like a dunce. All part of the learning curve, I guess. I had some of the fellas over the other night to have dinner and drink red wine from Savigny-lès-Beaune. Why Savigny-lès-Beaune? Well, a top bottle (not counting Leroy's Narbontons) costs about $50, a good villages wine should be in the mid $30's. That's real money, but it's pretty cheap as far as Burgundy goes. I wanted to drink several examples of the best bottles to see if they are undervalued within the pantheon of Burgundy terroir, or if they are simply more of that overpriced but merely decent wine from Burgundy. Any list of the best producers in Savigny would include Domaine Simon Bize, Domaine Jean-Marc et Hugues Pavelot, and Chandon de Briailles. Others include Maurice Écard, Camus-Bruchon, and Catherine et Claude Maréchal, and I'm sure I'm forgetting some. There were 7 of us at dinner and although no one discussed what to bring in advance, we got a great mix of wines from great producers. The shame of it is that nothing really showed all that well. I'm willing to bet it was a root day or a leaf day or something, because most of the wines didn't show much energy, their aromatics were subdued. Still, I learned a lot from this, particularly about the differences in terroir within Savigny-lès-Beaune. If you take a look at this map from the Burgundy-Report site, you can see that a river runs east/west through Savigny-lès-Beaune. The vineyards to the north of the river typically have heavier soils that are rich with clay. They lie on hills with southern exposure. These can be rich, dense wines. The north-side vineyard with the best potential is probably Aux Vergelesses, a 1er Cru that borders the 1er Crus of Pernand Vergelesses. The other 1er Cru sites that reliably produce very good wines include Les Fournaux, Gravains, Lavières, Aux Guettes, and Serpentières. South of the river the soils are sandier, more gravelly, and the exposure isn't as good. But it is from here that the appellation's most esteemed wines have traditionally come. The 1er Cru Dominode vineyard (always called "Les Jarrons" on vineyard maps) is said to make the finest wines of Savigny, although that might change as Patrick Bize's wines from Aux Vergelesses and Les Fournaux age and fully reveal themselves. Next to Dominode is Les Narbantons, a 1er Cru made famous by Lalou Bize at Domaine Leroy (but one can buy 3 or 4 bottles of Pavelot Dominode for the same price as one bottle of Leroy Narbantons). We began with a couple of white wines and gougères, my first attempt at making the delicious cheese puffs that are so common in Burgundy. The 2007 Domaine Marcillet Savigny-lès-Beaune, $28, Savio Soares Selections, was a surprising wine. It's a humble villages wine that packs a lot of punch. I've had this wine on several occassions and liked it very much, but this time around I thought the oak was a bit too much. The others liked it a lot though, and 3 hours later the wine had indeed integrated beautifully, showing ripe fruit, minerals, and an earthy pungency that I associate with Savigny-lès-Beaune. Levi said that it might have been the wine of the night for him. I served this wine alongside the 2007 Chandon de Briailles Savigny-lès-Beaune 1er Cru Aux Vergelesses, $48, Imported by David Bowler, which showed rather poorly. I liked the tropical aromas I was getting immediately after I opened the bottle, but no one really liked it a half hour later. My friend Clarke said that it had a vodka-type spirit essence to it, which was right on. It wasn't flawed, it was just weird. Among the red wines, the first flight was my favorite of the night. We drank the 2007 Jean-Marc et Hugues Pavelot Savigny-lès-Beaune 1er Cru La Dominode, $55, Becky Wasserman Selections, and the 2007 Simon Bize Savigny-lès-Beaune 1er Cru Aux Vergelesses, $52, Becky Wasserman Selections, with a hearty mushroom barley soup. These are both delicious wines that are quite forward and approachable, perhaps a characteristic of the 2007 vintage. Drinking them next to each other was a great lesson in Savigny-lès-Beaune terroir. The Pavelot Dominode showed a definite layer of gravelly stone underneath the pure and spicy red fruits. It was much less dense than the richer Bize wine, although no less intense. I liked it very much - it was my favorite wine of the night. The only question for me was whether or not it will age well, as it just didn't seem to have any excess or unresolved structure. The Bize Aux Vergelesses showed a darker fruit character and a much earthier nose, like wet clay. It had a lovely perfume and although it was drinking very well, it never fully unraveled and I imagine that it will do very well with 7-10 years of cellaring. We then drank two Simon Bize wines with braised beef and turnips. The 2006 Savigny-lès-Beaune Les Bourgeots, $35, and the 2006 Savigny-lès-Beaune 1er Cru Les Fournaux, $48. Les Bourgeots was aromatically closed, but showed pretty dark fruits on the palate and good balance. Les Fournaux had lovely floral and dark fruit aromatics, but was angular and awkward on the palate. These wines are probably starting to shut down. The next day I got to taste them again and they were both excellent. Bourgeots was a seamless expression of Savigny-lès-Beaune dark fruit and earth, completely pure and delicious, and drinking perfectly. Les Fournaux showed more depth and intensity of fruit, and still needed more time, although it was no longer awkward. Simon Bize's wines...very impressive. 2004 Pavelot 1er Cru Les Gravains, $45. Some nice things here, good fruit, but the wine was surprisingly evolved, and showed what I found to be unpleasant seaweedy notes. 1996 Pavelot 1er Cru La Dominode (magnum), $135. The only wine that provoked anything close to controversy, as some liked it more than others. I thought it was perfectly fine, but kind of anonymous and dull. It never really opened up, and I would be curious to know how it fared on day 2. 1990 Robert Ampeau Savigny-lès-Beaune, $40. Lots of fun to see what's going on with this bottle, a 20 year old villages wine from Savigny. But alas, it was pretty much dead on arrival. Yes, I know that you need to do a lot of aerating with Ampeau, and we swirled and swirled and opened it over an hour before drinking it, but all that was left was seaweed and rotting leaves. Lars Carlberg and Dan Melia, the two fine gentlemen of Mosel Wine Merchant, are in town this week with a few of the growers they represent. They hosted a dinner last night at Prune in the East Village, and I was lucky enough to attend. I know so tremendously little about German Riesling that it simply wouldn't be proper for me to try to discuss the wines in a meaningful way - I have no context to share with you, nothing to say about them other than how delicious they are. And they are very delicious. Instead, I can tell you a few things about Lars and Dan, and the work they're doing. Mosel WIne Merchant is not a large company. It's Lars and Dan - that's it. They're a couple of smart, well-educated, well-traveled, genuinely kind fellows who love wine, particularly Mosel Riesling. They could be doing many things that would probably be far more lucrative, but they run this little company together, bringing naturally made, small production Mosel Riesling to the US and other markets. They really believe in these wines, and it's easy to understand why after drinking them with dinner. Lars grew up partly in Germany and partly in the US - he lives in Germany now and runs all of Mosel Wine Merchant's European operations. Dan managed Prune for 8 years and left to travel in Germany. He's completely fluent in German - "his German is better than mine now," says Lars. Dan is the guy who schleps the wines all over NYC and the rest of the country, making sure that we have the chance to buy them in retail shops. Dan, left, and Lars, with 2007 Lauer Kern magnum. I sat next to Mattias Knebel at dinner. As he poured the first of his wines, the absolutely delicious 2008 Mosel Riesling von den Terrassen trocken, $20, I told him how much I enjoy his most basic wine, the humble 2008 Mosel Riesling trocken, $14. Matthias turned to me and smiled and said "I love making that wine. It's from our estate grapes, spontaneous fermentation, I make it the same way I make all my wines. We make no money on it at all, but I love it." The $14 Riesling Trocken is excellent wine, absolutely of its place, and should be part of everyone's under $15 wine repertoire. But the von den Terrassen is a serious step up for a few dollars more, with an expansive nose of ripe fruit and rock, and an ultra-clean palate that continued to grow even as we finished the bottle. It was perfect with seared monkfish liver finished in lemon and soy. The 2007's were lovely and interesting wines, but might now be entering a shutdown phase. The 2008's were showing beautifully, ripe but controlled, pure and elegant, and with a great balance of fruit and mineral. I loved drinking Knebel's 2008 Röttgen trocken next to his 2008 Uhlen trocken, the more muscular and concentrated Röttgen working perfectly with marrow bones and rock salt, while the wipsy and graceful Uhlen was delicious with a Parmesan omelet. I don't know how much those wines cost, but I would eagerly welcome both of them into my cellar. They drink so well now that it seems a shame to age them for 20 years, which Lars assures me is a great thing to do with these wines. Lauer's Rieslings were also delicious. They seemed to me to be more ethereal and less concentrated than Knebel's wines. There was a 2005 Lauer Kern with a mature and mellow nose that initially showed some peach and floral elements, but after 15 minutes in the glass, had morphed into liquid slate. There were two sparkling wines by Lauer that I thought were great. It's not often than inexpensive sparkling wines show textural finesse and elegance, and these wines were both wonderfully textured. The current release was lovely, with a good balance of fruit and mineral character, but the 1994 Sekt Reserve was for me, one of the wines of the night. Disgorged in December (although the label says March), it was fresh and lively. Changing constantly in the glass, it was about the bitterness of the pit and the saltiness of rocks, with this great lacy texture. I was sorry to see it go. Lars, Dan, and the growers are in NYC this week sharing their wines and stories at places like Chambers Street Wines, Uva, and Crush. These are good people doing good things, and their wines taste great and are reasonably priced. If you can make it to one of these tastings, you really should.